22 • January/February 2016 • Northeast Real Estate Business www.REBusinessOnline.com M A R K E T H I G H L I G H T: P H I L A D E L P H I A Philadelphia's retail scene made amazing strides in 2015. Aided by in- ternational events like Pope Francis' visit and the forthcoming Democratic National Convention, as well as nu- merous accolades recognizing the city as a top foodie and shopping destina- tion, the city's downtown is fourish- ing. 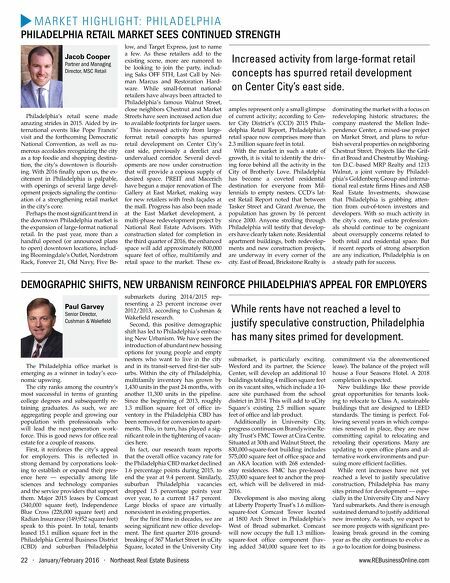 With 2016 fnally upon us, the ex- citement in Philadelphia is palpable, with openings of several large devel- opment projects signaling the continu- ation of a strengthening retail market in the city's core. Perhaps the most signifcant trend in the downtown Philadelphia market is the expansion of large-format national retail. In the past year, more than a handful opened (or announced plans to open) downtown locations, includ- ing Bloomingdale's Outlet, Nord strom Rack, Forever 21, Old Navy, Five Be- low, and Target Express, just to name a few. As these retailers add to the existing scene, more are rumored to be looking to join the party, includ- ing Saks OFF 5TH, Last Call by Nei- man Marcus and Restoration Hard- ware. While small-format national retailers have always been attracted to Philadelphia's famous Walnut Street, close neighbors Chestnut and Market Streets have seen increased action due to available footprints for larger users. This increased activity from large- format retail concepts has spurred retail development on Center City's east side, previously a derelict and undervalued corridor. Several devel- opments are now under construction that will provide a copious supply of desired space. PREIT and Macerich have begun a major renovation of The Gallery at East Market, making way for new retailers with fresh façades at the mall. Progress has also been made at the East Market development, a multi-phase redevelopment project by National Real Estate Advisors. With construction slated for completion in the third quarter of 2016, the enhanced space will add approximately 800,000 square feet of offce, multifamily and retail space to the market. These ex- amples represent only a small glimpse of current activity; according to Cen- ter City District's (CCD) 2015 Phila- delphia Retail Report, Philadelphia's retail space now comprises more than 2.3 million square feet in total. With the market in such a state of growth, it is vital to identify the driv- ing force behind all the activity in the City of Brotherly Love. Philadelphia has become a coveted residential destination for everyone from Mil- lennials to empty nesters. CCD's lat- est Retail Report noted that between Tasker Street and Girard Avenue, the population has grown by 16 percent since 2000. Anyone strolling through Philadelphia will testify that develop- ers have clearly taken note. Residential apartment buildings, both redevelop- ments and new construction projects, are underway in every corner of the city. East of Broad, Brickstone Realty is dominating the market with a focus on redeveloping historic structures; the company mastered the Mellon Inde- pendence Center, a mixed-use project on Market Street, and plans to refur- bish several properties on neighboring Chestnut Street. Projects like the Grif- fn at Broad and Chestnut by Washing- ton D.C.-based MRP Realty and 1213 Walnut, a joint venture by Philadel- phia's Goldenberg Group and interna- tional real estate frms Hines and ASB Real Estate Investments, showcase that Philadelphia is grabbing atten- tion from out-of-town investors and developers. With so much activity in the city's core, real estate profession- als should continue to be cognizant about oversupply concerns related to both retail and residential space. But if recent reports of strong absorption are any indication, Philadelphia is on a steady path for success. 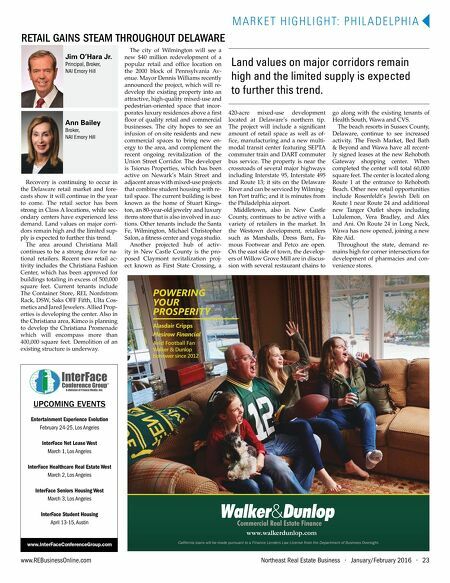 Jacob Cooper Partner and Managing Director, MSC Retail PHILADELPHIA RETAIL MARKET SEES CONTINUED STRENGTH The Philadelphia offce market is emerging as a winner in today's eco- nomic upswing. The city ranks among the country's most successful in terms of granting college degrees and subsequently re- taining graduates. As such, we are aggregating people and growing our population with professionals who will lead the next-generation work- force. This is good news for offce real estate for a couple of reasons. First, it reinforces the city's appeal for employers. This is refected in strong demand by corporations look- ing to establish or expand their pres- ence here — especially among life sciences and technology companies and the service providers that support them. Major 2015 leases by Comcast (340,000 square feet), Independence Blue Cross (228,000 square feet) and Radian Insurance (149,952 square feet) speak to this point. In total, tenants leased 15.1 million square feet in the Philadelphia Central Business District (CBD) and suburban Philadelphia submarkets during 2014/2015 rep- resenting a 23 percent increase over 2012/2013, according to Cushman & Wakefeld research. Second, this positive demographic shift has led to Philadelphia's embrac- ing New Urbanism. We have seen the introduction of abundant new housing options for young people and empty nesters who want to live in the city and in its transit-served frst-tier sub- urbs. Within the city of Philadelphia, multifamily inventory has grown by 1,430 units in the past 24 months, with another 11,300 units in the pipeline. Since the beginning of 2013, roughly 1.3 million square feet of offce in- ventory in the Philadelphia CBD has been removed for conversion to apart- ments. This, in turn, has played a sig- nifcant role in the tightening of vacan- cies here. In fact, our research team reports that the overall offce vacancy rate for the Philadelphia CBD market declined 1.6 percentage points during 2015, to end the year at 9.4 percent. Similarly, suburban Philadelphia vacancies dropped 1.5 percentage points year over year, to a current 14.7 percent. Large blocks of space are virtually nonexistent in existing properties. For the frst time in decades, we are seeing signifcant new offce develop- ment. The frst quarter 2016 ground- breaking of 367 Market Street in uCity Square, located in the University City submarket, is particularly exciting. Wexford and its partner, the Science Center, will develop an additional 10 buildings totaling 4 million square feet on its vacant sites, which include a 10- acre site purchased from the school district in 2014. This will add to uCity Square's existing 2.5 million square feet of offce and lab product. Additionally in University City, progress continues on Brandywine Re- alty Trust's FMC Tower at Cira Centre. Situated at 30th and Walnut Street, the 830,000-square-foot building includes 575,000 square feet of offce space and an AKA location with 268 extended- stay residences. FMC has pre-leased 253,000 square feet to anchor the proj- ect, which will be delivered in mid- 2016. Development is also moving along at Liberty Property Trust's 1.6 million- square-foot Comcast Tower located at 1800 Arch Street in Philadelphia's West of Broad submarket. Comcast will now occupy the full 1.3 million- square-foot offce component (hav- ing added 340,000 square feet to its commitment via the aforementioned lease). The balance of the project will house a Four Seasons Hotel. A 2018 completion is expected. New buildings like these provide great opportunities for tenants look- ing to relocate to Class A, sustainable buildings that are designed to LEED standards. The timing is perfect. Fol- lowing several years in which compa- nies renewed in place, they are now committing capital to relocating and retooling their operations. Many are updating to open offce plans and al- ternative work environments and pur- suing more effcient facilities. While rent increases have not yet reached a level to justify speculative construction, Philadelphia has many sites primed for development — espe- cially in the University City and Navy Yard submarkets. And there is enough sustained demand to justify additional new inventory. As such, we expect to see more projects with signifcant pre- leasing break ground in the coming year as the city continues to evolve as a go-to location for doing business. Paul Garvey Senior Director, Cushman & Wakefeld DEMOGRAPHIC SHIFTS, NEW URBANISM REINFORCE PHILADELPHIA'S APPEAL FOR EMPLOYERS While rents have not reached a level to justify speculative construction, Philadelphia has many sites primed for development. Increased activity from large-format retail concepts has spurred retail development on Center City's east side.